For long-range shooters the marriage of the ultra-strong .338 Lapua Magnum case and affordable, high-BC 30-caliber projectiles provides the “ultimate” in long-range performance. Officially introduced in 1989, the .338 Lapua Magnum soon attracted the attention of wildcatters, most of whom necked down the case to shoot 30-caliber match bullets. With its monster, 113-grain case capacity and 68,000+ psi pressure rating, the .338 case can push the heavy 200 to 240-grain, 30-caliber bullets to amazing velocities. There have been many versions of the 30-338, some with improved shoulders for MORE capacity, some with the shoulders pushed back for LESS capacity. In 2007 Tom Sarver set a spectacular 1000-yard record using his own shortened 30-338 wildcat, the “.300 Hulk”. While nearly every 30-338 you see in the USA is a wildcat, manually formed by necking-down the .338 Lapua brass, there was an “official” version, the .300 Lapua Magnum. Lapua produced enough factory ammo to get the .300 Lapua Magnum sanctioned as an official CIP-certified cartridge. 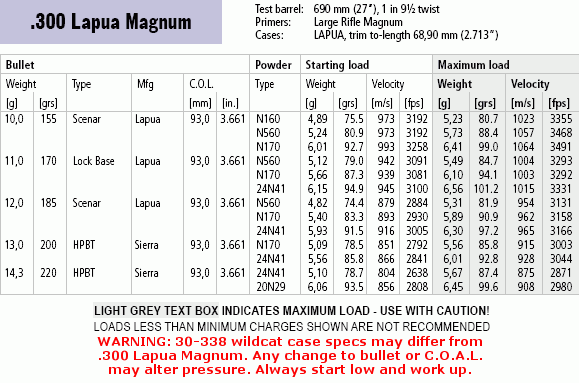 Sadly, though, .300 Lapua Magnum ammo is not produced commercially at this time; currently the “official” .300 Lapua Magnum exists only as a CIP datasheet. However, the 30-338 Lapua wildcat is very much alive. It is popular with thousand-yard benchresters, big game hunters, and long-range tactical shooters. The Lapua brass is readily available and Redding now produces 30-338 dies. 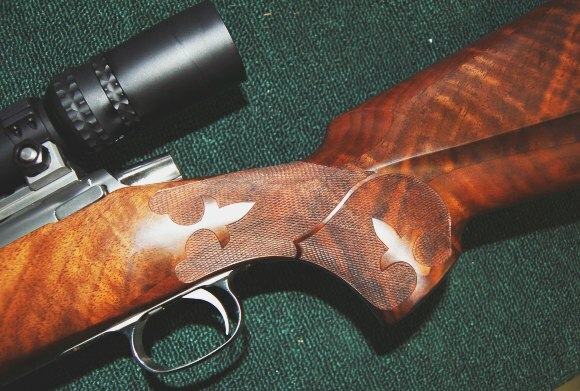 Respected gunsmith Richard Franklin uses the 30-338 for long-range game hunting and varminting. Richard has worked with the cartridge for quite some time, and in this article he shares his knowledge of the 30-338. 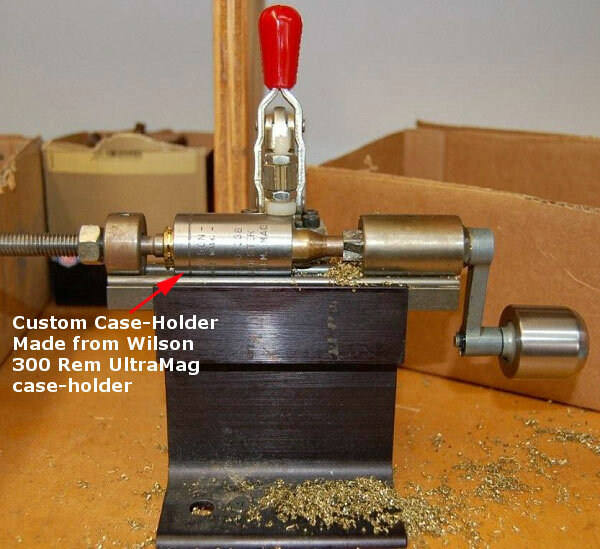 Richard explains how to avoid common problems when forming the cases, and how to optimize your reloading set-up to get the most performance out of this powerful cartridge. Vihtavuori does include .300 Lapua Magnum load data in the current Vihtavuori Load Manual. That reloading guide shows the .300 Lapua Magnum can drive a 220gr HPBT Sierra MatchKing at 3044 fps with a max charge of VV 24N41 powder. The .300 Lapua Magnum can push the 30-caliber 155gr Lapua Scenar at nearly 3500 fps with VV N170 powder. That’s impressive performance indeed! CLICK HERE to download Current Vihtavuori RELOADING MANUAL (35-page .pdf file). 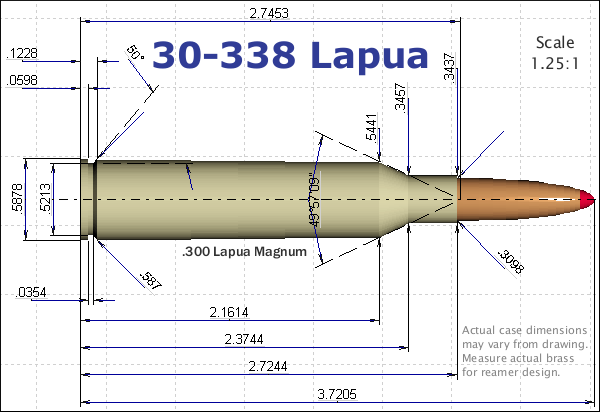 Though Lapua got CIP certification of the “.300 Lapua Magnum” (a .338 Lapua Magnum necked down to .308), there is no SAAMI equivalent, and the round never entered mass production. For practical purposes, then, in the United States, the 30-338 Lapua is best viewed as a wildcat cartridge. Long-range shooters have been tinkering with the .338 Lapua case for some time, but Redding just recently started making dies for the 30-338. What we now need is for Wilson to make their top of the line bushing neck die and straight line seater for the 30-338 Lapua. The Wilson dies will give much better accuracy due to less bullet run-out and more precision in controlling neck tension with the inter-changeable neck bushings which are available from Redding and Wilson in many sizes for all calibers. (1) Hornady 30 Caliber neck sizer. This die has a large cavity so that many different size cases can be necked down from 338 to 30 caliber. (2) Wilson case holder for the 338 Lapua case which is used in the Wilson trim to length tool in the background. (3) Wilson (or similar) chamfer tool to chamfer or ease the mouth of the case after trimming to length. (4) Imperial sizing die wax to lube case necks. (5) K&M 30 caliber one thousandths oversize expander. (6) RCBS # 14 (or equivalent) shell holder to fit the 338 Lapua brass. You want to remove the firing pin from the rifle bolt and test cases for headspace fit when reducing case necks in size. Screw the die into your press and with a piece of brass in the shell holder, run the ram up to the top. Screw the die down till it stops against the case. Then lower the case a bit and turn the die down about two turns and run the case neck up into the die. Be sure to evenly lube the outside of the case necks with Imperial sizing wax. This lubricant is perhaps the best available. It will clean up easily with a wipe of a paper towel and is not messy. Continue to screw the die down in small increments till you see the neck is being sized down near the base of the neck, near the case shoulder. With the firing pin removed from your bolt (for more feel) try to chamber the case. If it is tight you want to screw the die down a bit and run the case into it again. Continue to do this till the case is an easy fit in your chamber. The reason we do this incrementally is to ensure the neck is not sized down too much at the case shoulder. We want it to be a PERFECT fit. Lock the ring and run all your cases through the die. We now find after sizing down the necks that they are too small to be run into the Redding sizing and de-prime die (inside expander button won’t fit) so we fix this easily with the tool shown below. This tool screws into your press. How far you screw it into the press does not matter, usually I will screw it down as far as I can so I can see the case neck going into it as I raise the ram. You will want to screw the little bolt out as it is a stop to prevent the necks being rammed up into the bottom of the mandrel holder and doing something bad to the case neck. Be sure to apply sizing wax to the inside of all case necks (and the mandrel itself) to make this operation easier. Run all your cases up onto this mandrel to expand the necks to the proper size, otherwise you will not be able to get them into the Redding sizing die as the button that runs inside of the case neck will not fit. You must expand the necks first–This is imporant! If you run the brass in the sizing die without expanding first, you will wreck the case necks. Screw the resize die into your press until you can see that it is resizing about two-thirds of the neck. Adjust the decapping pin in the die so that it will knock out a spent primer. (Be careful not to leave the decapper too long or the fat part of the decapper shaft can contact the primer pocket on the inside.) Now run all your cases through this die. The necks will now allow a bullet to be seated without undue neck tension. The Wilson case-trimming tool is the best I have ever run across. It will trim case necks perfectly square to the centerline of the case which is of great importance in obtaining good accuracy. Trim all cases to 2.710″ in length. You will then be able to fire them multiple times before they need trimming again. When I started working with .338 Lapua cases, Wilson did not offer an appropriate case-holder. So, I made my own 338 Lapua case holder from a Wilson 300 Rem Ultra-Mag case holder. I merely ran a 30-338 Lapua re-size reamer into the Ultra-Mag case holder. I also made a knob from stainless steel for the tool as the one that came on it was made of aluminum and was too small. (It also made you hand black as the Ace of Spades.) My Wilson tool is old. It came with the clamp and base. This tool requires a different case holder for every case you work with. You will want to slightly ease the sharp edge left on the case mouth after trimming to length. The inside of the case neck is of great importance to accuracy. Go very easy on the inside of the case neck and just barely remove the sharp edge. Chamfering the outside of the case neck is of lesser importance for accuracy, but you want to remove burrs and snags, and inspect carefully for gouges that might later split. Now you want to clean all the Imperial sizing wax from your cases. If I have only a few I will use a Q-tip with brake parts cleaning fluid on the inside of the case neck and the same fluid on a rag for the outside of the case. If I have a hundred or more cases I will spray a can of the brake parts fluid into a gallon coffee can and just dump in the cases and swish around for a while and them take them out, letting them dry completely before loading them. Haydon carbide primer pocket tool. I have found that this operation is important for good accuracy with the 30-338 cases. A nice primer pocket uniforming tool (with carbide cutter) is available from Russ Haydon’s Shooters’ Supply. It has a shoulder which prevents it from cutting the pocket too deep and ensures all pockets are the same depth. The Haydon tool comes with either a plastic or knurled metal handle for manual use. But hand-work is a slow process. To speed things up, I remove the handle and chuck the tool body into my cordless drill. I also use this tool to clean primer residue from fired cases and it will keep all pockets exactly the same depth. To prime your cases, the RCBS bench-mounting priming unit (with tubular drop feed) is the best priming tool I have used. It gives good feel and is fast and easy to use. 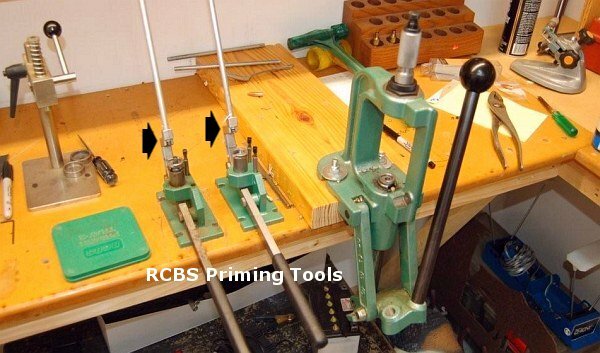 In the photo below, twin RCBS priming tools are mounted side-by-side. The primers are carried in the metal tube that extends up. Each time you work the handle a new primer feeds automatically. 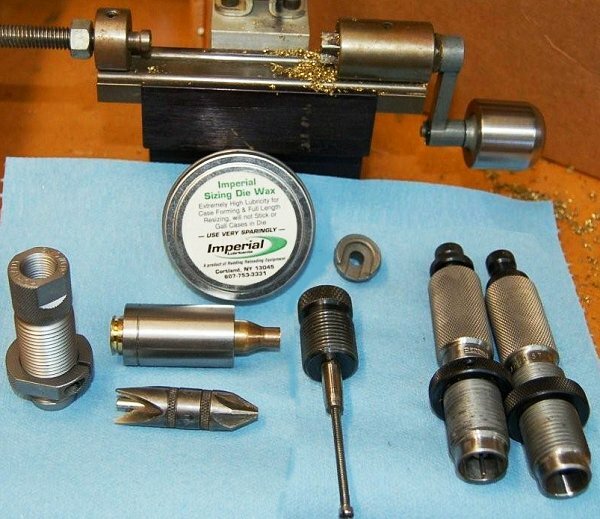 The picture below shows other important reloading gear including a Rockchucker press and Arbor press (for hand dies). For throwing charges, I prefer to use the RCBS ChargeMaster 1500 electronic powder dispenser/scale for all hunting loads. It is very accurate and the Elk, Deer and Groundhogs will not be able to determine the difference in 1/10th grain of powder. Be sure to keep a little catch-box under the powder drain spout (on the right side of the machine). If you forget to close the spout, you’ll get powder all over the place. The 30-338 (aka .300 Lapua Magnum in Europe) is a very large, overbore cartridge. Accordingly, with heavy, high-BC bullets such as the 240gr Sierra MatchKing, the 30-338 performs best with powders with a very slow burn rate such as: Alliant Reloder 25; Hodgdon H1000, H50BMG (ADI 2218) and Retumbo; IMR 7828ssc; Norma MRP, and Vihtavuori 24N41 and N170. Magnum primers are recommended for most of these powders. For the 240gr MK, QuickLoad predicts the highest velocities (3000+ fps) could be achieved with H50BMG. For 30-Cal bullets in the 200-210gr range, such as the Berger 210gr VLD, the same powders listed above will work, but you should also get good results from slightly faster-burn-rate powders such as Alliant Reloder 22, and Hodgdon H4831sc. Richard built a 30-338 for a client who developed a nice load with Berger 190s and RL22. But with 200s you’ll still probably see the best velocities with slow burners such as Hodgdon H50BMG, and Norma MRP. At the other end of the spectrum, Varminters who seek maximum “red mist” effect on groundhogs and other prey have experimented with bullets as light as 125 grains. Richard Franklin uses the 125gr Nosler in his “300 Varminter” rifles. This is a 300 WSM with a slow, 14- or 15-twist barrel. As the 300 WSM cartridge can exceed 3900 fps with a 125gr Nosler, the 30-338, with the right powder and barrel twist, should be able to top 4000 fps easily. QuickLoad projects peak velocities for a 125gr Nosler in a 30-338 would be delivered by Vihtavuori N560, Hodgdon H4831sc, and Norma MRP, in that order. But this is just a projection. We don’t have field data to back that up. The lightest bullet listed in the Vihtavuori load manual for the .300 Lapua Magnum (factory 30-338) is the 155gr Lapua Scenar. For this projectile, the VV Manual predicts 3491 fps with a max load of Vihtavuori N170. Lapua did obtain CIP certification for the .300 Lapua Magnum cartridge, the official version of the 30-338 wildcat. The pressure rating for the cartridge is a whopping 68,168 psi, or 4700.00 bar. That exceeds the rating of the vast majority of cartridges. For example, the 300 WSM is rated at 64,542 psi. 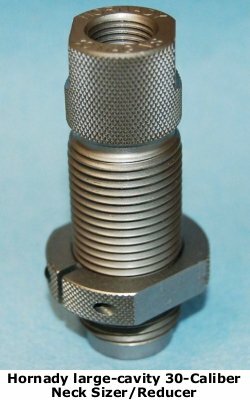 So…you may be testing the strength of your action and scope mounts before you reach the pressure limits with this cartridge. Nonetheless, you should use caution when loading for the 30-338. With a case capacity in excess of 100 grains, the 30-338 is serious business. Load data for the .300 Lapua Magnum is available in the current Vihtavuori load Manual. CLICK HERE to download latest Vihtavuori Reloading Guide (35-page PDF). Get your proper seating depth for the individual bullet you will use and load and shoot. Currently, only Redding makes “production” dies for the 30-338 Lapua. We will have to put up with them until Wilson or someone else makes good benchrest hand dies for it. Maybe you can find a smith to custom make you a set from the Newlon die blanks or the Wilson die blanks. Neck-Sizing vs. Full-length Sizing: In Step 3 you’ve set your Redding sizing die to size about two-thirds of the case neck. That’s a good starting point, and I’ve found that you probably won’t need to full-length size these cases every time. You want to full-length resize only when cases are too tight in your chamber. Sometimes, after shooting “hot” loads, the case will expand, leading to stiff bolt lift and subsequent hard chambering. When working with this cartridge, you will need to learn when a case expands too much and accordingly needs the shoulder bumped. 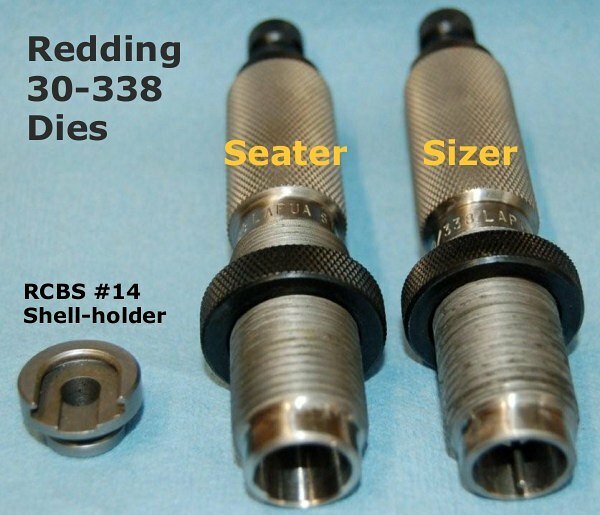 You can purchase a Redding Body die for bumping shoulders. 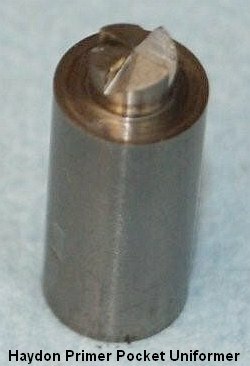 IMPORTANT: Depending on the headspace in your rifle you may need to cut a few thousandths from the bottom of this die. My Precision Reloading DVD shows all you need to know about bumping case shoulders and the use of Wilson reloading dies and tools. I wrote this article because I’ve found that many reloaders working with the 30-338 Wildcat are having problems preparing their cases. They mess up their necks, struggle with the dies, or their brass may have chambering issues. To do it right, you need the correct dies, and you must neck-down/expand/neck-size in the right sequence. If you depart from these instructions you are going to have problems re-sizing case necks from .338 to .308. Follow the instructions and you’ll get good results, and you’ll have brass that chambers easily and shoots accurately right from the start. I do not waste barrel life by fire-forming cases without bullets into the air or with corn starch and other crap. I work up full-power hunting loads in my new cases and hunt with them. After going through the procedures outlined here, the cases fit the chamber well so I can load and shoot. Usually the new brass rivals the accuracy of once-fired brass and sometimes new brass delivers better accuracy than fire-formed cases. Every piece of brass wants to be perfectly formed the very first time you fire it.